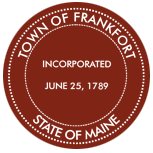 The Town of Frankfort is a small Waldo County town located on Route 1A on the west side of the Penobscot River in the shadows of Mount Waldo, halfway between Bangor and Belfast. 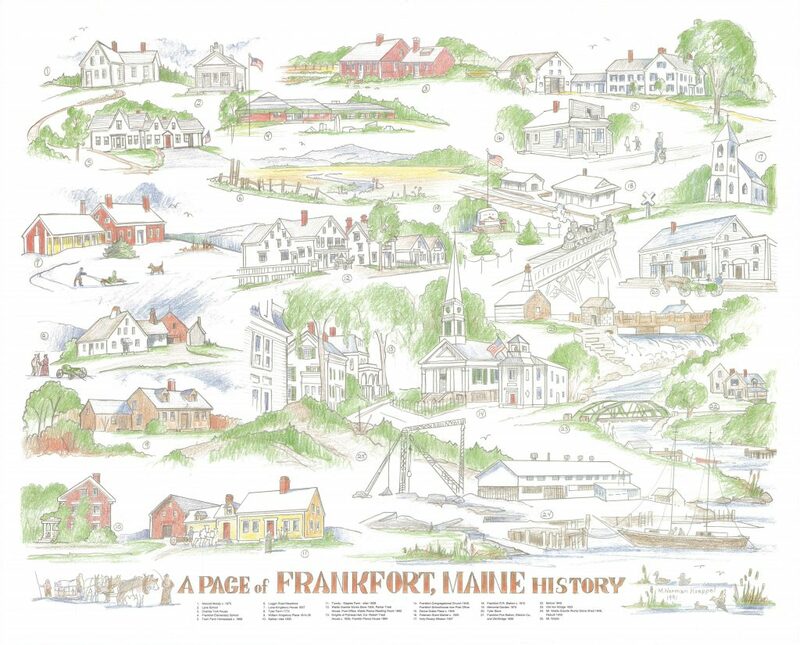 The land now known as the Town of Frankfort some say was discovered in the early sixteen hundreds when Captain Wentworth, on his ship named the Archangel sailed into what is now Penobscot Bay. After anchoring, he and his crew took small boats up the river. The land he founded included what is now Belfast up the river to Hampden. In 1773 one hundred thousand acres, belonging to General Waldo, is now the land that includes Hampden, Frankfort, Winterport, and parts of Swanville and Monroe. Early settlers of Frankfort include Joshua Treat Jr., Oliver Parker, Phineas, Enoch and Eleazer Kingsbury, Col. Andrew Tyler, Waldo Pierce, John Rowe, Eli West, and the Ide and Lane families. In 1774 Joshua Treat Jr. built the first log house in Frankfort, he lived there until 1816 then moved to a farm on Treat Point. He also built the first saw mill on Marsh Stream in 1779. His grandsons, William and James, became Treat and Company where they built and owned many shipping vessels. The Treat name is very common in Frankfort history. Col. Robert Treat built what now known as the Waldo Pierce Reading Room. Robert was one of the four citizens of the town to serve in the war of 1812. Oliver Parker came from Massachusetts on horseback, with his wife and children. After arrival they took land across from Marsh Stream and settled there. Later on Hannah Kingsbury Drake built a house above there, later known as the Kittridge property. The house burnt in 1960’s. Now the property is Winterport Mattress and Furniture. Phineas Kingsbury and his family built across from the Parker House. Phineas served as the first Selectman of Frankfort from 1789 to 1828. Eleazer Kingsbury settled on the Green Brook, in the shadows of Dutch Mountain. Later Albert Kingsbury built on the west side of the mountain. Nathaniel Lane built a house in the area on Lane Hill built of bricks made by him, now known as the Tim Kingsbury home. Col. Tyler built on Tyler Lane. His descendants were instrumental in the growth of granite production and ship building. The West family settled in a farm on West Hill. On May 16, 1789 a petition to incorporate with 39 signers was sent to the General Court in Boston, Massachusetts, and on June 25, 1789 an act of incorporation was passed and after much discussion they settled on the name of Frankfort. We could have been called Knoxbury. There were about sixty families at that time. In 1860 Winterport left Frankfort and became its own town. Ship building, lumbering, granite, and agriculture were a great part of our early history, and continued the growth of the town. Several ships were built in Marsh Bay including the ship Robert Treat and the schooner Ada Wiswell. The vast amounts of forest made it possible for the lumbering industry to flourish. The lumber was shipped far and wide. It was the start of the community, log cabins were built and later beautiful homes. Joshua Treat built the first water powered sawmill on Marsh Stream in 1774. The dam that is stands now was built in 1904. The last people to operate a sawmill there was Earl Grendell in the 1940’s. Early farmers not only provided food for the family, but also hay, animal meat, eggs and other farm products that was exported by a Boston boat. Frankfort was probably best known for its gray and white granite. Removal and sale of granite began in 1836 from Mosquito Mountain. In 1846 operations were moved to the Mount Waldo, where the granite was better quality. It was moved from the mountain by oxen teams and derricks to the wharf on Penobscot River, the water ways provided easy and cheap transportation. At that time, Fort Knox was being built and that is where some of the first stones where used. The wharf area now is where out boat landing is located on Route 1A. Rowe and Pierce operations at the quarry brought settlers to town for work. Homes were built in the area. In 1850 there were 80 men employed and the output 20,000 tons yearly. The granite business flourished and in 1901 Frankfort’s John Pierce was famous country wide for his granite production. The last stone was quarried in 1914 from Mount Waldo. The quarry remained idle until 1931 when Grenci and Ellis restored the business and it operated until 1965. Granite from Frankfort can be found locally and around the United States. The Washington Monument, The Tomb of the Unknown Soldier, Senate Office Building in Washington D.C., the piers of the Brooklyn Bridge in New York, Fort Knox (when it was built in the late 1800’s), Eastern Maine Medical Center, the old Bangor Post Office, and the base of the Paul Bunyan Statue. Frankfort obtained the quarry and land from the State of Maine in 1989. Loose granite is still sold by the town from the quarry and surrounding land. All revenue earned from granite sales goes into the recreation fund. The boat landing is now where the stone shed and wharf used to stand. Thanks to granite, lumber and ship building, Frankfort was a growing town in it’s heyday in the late 1800’s and the early 1900’s. Stores and shops lined Main Street. There were apartments, boarding houses in Paddy Hollow for the many families that moved here to work in the quarry. Hotels including a large manor with a livery on the corner heading toward Winterport, home of Grace Fletcher Kelly. There was also Edminister Hall on the back alley road known today as Averill Street. The buildings both burnt in the early 1900’s. There was also a large building built by the Knights of Pythias for their meetings, later used as a town hall where town meetings and events were held. The building was torn down in the early 1970’s. The building stood where the Memorial Park is now. In early days transportation between was by water, pocket ships, and later on riverboats where used for passengers and produce. In 1833 you could go to Boston from Bangor for $6.00, meals and a berth included. Roads were slow coming to town and were the main topic at a town meeting in 1837, where $6,000.00 was raised for repair and building of roads. Town meetings were held once a month in our early history. In 1906 the B&A railroad extended through Frankfort to Belfast. The station was located on West Hill above where Robert Hussey lives. The railroad gave citizens another way of travel and ways to ship their product. The mail was delivered in the late 1700’s and early 1800’s by horse back once every two weeks at first then to twice a week in 1812.. The first Post Office was located in the village where Jeff Anderson lives now. In 1922 a new building was built across from where Lawrence and Charlene Brassbrige now live. It was a combination of Post Office and store. The Post Office moved from there to where it is today. In the early 1900’s there were about 25 families with telephones. Some people in town did not get electricity until 1939. The Frankfort Congregational Church was built in 1849 on the site of the first log cabin in town. It served as a place of worship for Congregationalist, Methodist, and Universalist. In 1851 the church became a Congregational church. In 1903 more than 150 families attended. The clock in it’s steeple, known as the town clock was presented to the town in 1887 by Mrs. Haywood Cushing of Boston, a former resident of Frankfort. The Catholic Church, called the Holy Rosary Mission stood behind what is now the Jeff Anderson’s property, high on the hill over looking the town. It was built in 1909 by citizens of Frankfort, both Protestants and Catholics. Many of the immigrants that had come to work in the quarry attended the church. The church was torn down in the late 1960’s. The first library was located on the Loggin Road across from where Lawrence and Charlene Brassbridge live. The building was given to the town by Florance Cushing in memory of ther grandfather Waldo Pierce, a trust fund was set up as well. The building burnt and the library was moved to where it is presently located. We have a trustee of the Waldo Pierce Library, Ruth Treat Kroll, who was born and brought up in Frankfort. She is a descendant of the Treat family. They have their meetings ins house built by Robert Treat. In the early 1800’s and 1900’s one room schools could be found in many areas around town. In 1905 a new school was built in the village next to the church. High school and grade students shared the building. The last high school class to graduate from Frankfort High School was in 1938. After that the high school students were tuition to Winterport and Hampden, and only grade school students were taught in the village school. The Lane School, one of the early schools, was still used as a grade school as well. The village and the Lane School closed and in 1967 the town voted to enter MSAD #56. A new elementary school was built on North Searsport Road in Frankfort for grade school students, junior high and high school students went to Searsport. After a vote in 2013 to join RSU #22, the elementary school was closed and the students now go to Winterport and Hampden schools. This is just some of the history for the Town of Frankfort. There is great old map in the town office that shows roads and buildings in the 1800’s.